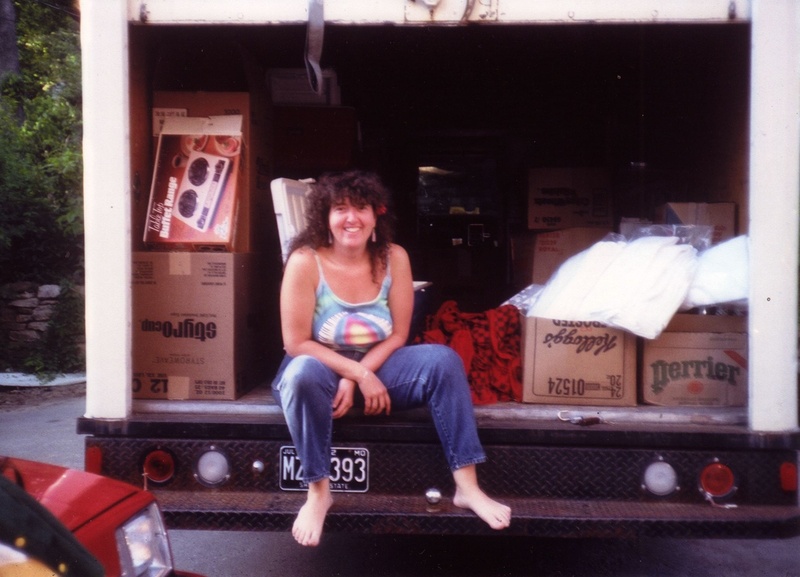 Sitting in the back of my 15 ft. catering truck, Honey, in 1985.
in Kansas City. Throughout those years I had many interesting and humorous experiences with most of the popular musicians of the day. Shortly after leaving the music industry and moving to the little town of Eureka Springs, Arkansas, I began to write down those experiences. After almost 17 years of collecting stories, I have captured it in a book called, Rock & Roll Medicine©. This website is created to bring you some excerpts of those stories, in the form of a multi-media presentation of my memoir, written with the help of my husband, Mark. I hope you will enjoy your visit here. Feedback and corrections are welcome.